A pretty unique site, still partially shrouded in mystery and still under military control, this is the place Stalin had built as an emergency relocation command post and living space for himself and the high command on the eastern outskirts of Moscow in the run-up to WWII. Long a well-kept secret and then forgotten, the sight was opened up to visitors in the 1990s. Visits are by guided tour only and these tours have to be pre-booked in advance and are rather costly. But it's an interesting and at times fun experience, rather less serious than you would perhaps expect given the topic. More background info: As is well known, Stalin was rather paranoid when it came to his personal safety and his total grip on power. So it isn't all that surprising that during the 1930s he was looking for a possible place to hide in safety, but still in the vicinity of the Kremlin in Moscow, should it become necessary. This was certainly the case when the Nazis had risen to power in Germany, and it became patently urgent when the Wehrmacht was invading the USSR and heading for Moscow. Instead of digging in deep underground and relying on massive fortifications, Stalin had a different idea. He was relying on camouflage – the bunker was located at a newly built sports stadium – Stalin assumed that while the Nazis would have no qualms about bombing Moscow's Kremlin and other grand architecture to smithereens, they'd spare something like a sports stadium, not just because they were sacrosanct to them but for the very practical reason that they'd want intact stadia to put on their own propaganda parades and rallies (see Nuremberg), so they'd need them to survive. Whether Stalin really followed this reasoning or if it's just a myth is hard to say. The same goes for the claim that there is an over 10-mile (17 km) underground road tunnel leading all the way to the Kremlin, or that there is a connection to the fabled Metro-2 system and that that's why nearby Partizanskaya station has a mysterious extra central track between the two main platforms and regular metro tracks. Metro-2 is the name given to an alleged mysterious system of top-secret underground railway lines paralleling the official metro that was started during Stalin's time and is rumoured to be still in existence or even active use. But that's probably more stuff for conspiracy theorists than reality. Anyway, construction of the bunker and the stadium was started sometime in the mid 1930s but halted at the outbreak of the Russo-Finnish War in 1939. The stadium, originally intended for 120,000 spectators was never finished (only one grandstand for 20,000 was completed), but the bunker was ready for use by 1941. Whether Stalin ever visited the bunker, and if so how often, is also unclear and different claims about this exist. If he did visit then only briefly, and by December 1941, when the Red Army's counteroffensive began to drive the German Wehrmacht back westwards, the bunker soon lost its purpose. What happened with the bunker after the war is, again, not easy to ascertain. The stories one can find range from it being used as a warehouse to having continued to be in secret military service. The site is said to be still in the possession of the military, yet in 1996 it was first opened to visitors, after extensive 'refurbishment', and is now run as a branch of the Central Armed Forces Museum. What there is to see: Our group was met at Partizanskaya metro station (see below) and we were walked all the way to the stadium, through the security gate and to the entrance to the bunker. There we were handed over to an on-site guide, who also spoke reasonably good English. Before going inside we had a moment to inspect the space outside the door, especially the two tanks on plinths atop a slope above the access gate to another tunnel opposite the bunker entrance (more on that later). In contrast to what it must have been like in the bunker's secret past, there were flags flying on both sides of the entrance. So it is not hidden as such, it's just in an unexpected location. Nor does the bunker go underground. The entrance tunnel is almost level with the ground, just five steps lead down about a metre just behind the entrance. There are no blast doors or anything like that. But the inside is allegedly protected by a thick layer of reinforced concrete above the ceiling. You cannot see that, though. Inside, a colonnaded corridor leads to the main hall. Dotted in between the columns are dummy soldiers in a range of different uniforms, including (surprise!) a Nazi one (even SS, going by the skull on the cap). The main hall is surprisingly roomy and has a large conference table in the shape of a ring in the middle, with seats for at least three dozen people. 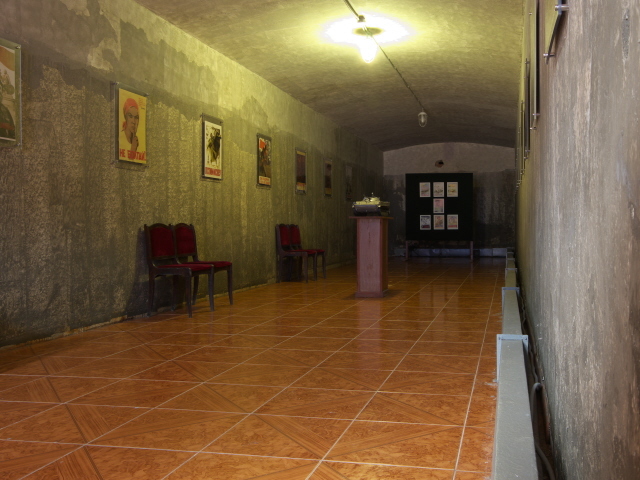 The walls are lined with paintings of Stalin and various war scenes. Behind the table arrangements there are dotted around a few bilingual information panels, clearly gleaned from the museum's website (they looked instantly familiar) and in rather imperfect (machine-)translation English. At the far wall is a kind of stage with a curtain, flanked by a rather oversized-looking PA system. So I guess other kinds of events must take place here too. We were allowed to poke around a little on our own first, then the guide asked us to sit down at the row of saets at the central table and started her introductory lecture. Stalin obviously featured in the narrative a lot, including a digression addressing the issue of whether it can be justified to revere the great Commander so at a place like this, given he was also responsible for so much suffering and darkness. I was, a little surprised that this issue was at least acknowledged (and quietly wondered whether non-foreign visitors will hear this too). Unsurprisingly, the conclusion on balance was that we have to give Stalin deserved credit for “his” victory over fascism in WWII … obviously. An interesting detail concerned the central domed ceiling in the centre of the room inside the conference table ring. Apparently it was constructed in such a way that it a) amplified Stalin's voice (apparently he was quite a soft-spoken guy) and b) make any whispered remarks more audible. I was invited to test the acoustic phenomenon by stepping right under the centre of the dome and making some noises (like clapping hands). The reverberation effect was indeed phenomenal! We were then led into a small room up a few steps to the one side of the main hall. This has been reconstructed as Stalin's study. You can even sit at his desk, pick up his phones and re-enact angry conversations with imaginary minions at the other end. Behind the desk, and coverable by a yellow curtain, hangs a map showing the front lines during the unsuccessful attempt by Nazi Germany to conquer Moscow in WWII (i.e. the time Stalin would most likely have been using this bunker … if he ever did – see above). The other walls are adorned with oil painting portraits of the usual suspects (Marx, Engels, Lenin, etc.). In one corner of the study there's a big white marble Stalin bust and in the opposite corner a special games table for some military strategy game that our guide explained, but I can't recall the details. I just noticed that the table came complete with little ashtrays you can pull out and I tried to imagine what the air in this bunker must have been like at the time (when everybody seemed to have been heavy smokers). Back in the main hall, we were led to one corner where a little table was stacked high with red-covered books (called 'Kniga Pamyati', i.e. memorial books listing the names of fallen soldiers) and next to it a steel helmet and a Kalashnikov were provided to pose for photos with. I'm not one for such prancing about but a couple in our group couldn't resist. They were having a good laugh. Note that not all rooms in the bunker are accessible to the public. The generals' room/High Command Room as well as service rooms remain off limits. Furthermore, one other room was temporarily inaccessible because it was undergoing restoration at the time of our visit, namely what the text on a panel called Stalin's “rest room” (by which I think they meant literally a room where he could have rested in, i.e. on a bed or sofa rather than what you may have thought …). But the final part of the tour took us to the so-called “canteen”. This turned out to be a full-on Georgian wine tavern, with heavy wooden tables and benches, a bar, stacks of (decorative) wine barrels and rustic decorations. Some in our group tried a door at the rear they presumed locked but found it open. Behind it a dimly lit party cellar zone continued. So I assume the premises are also hired out for corporate events, parties, perhaps even weddings and the like. 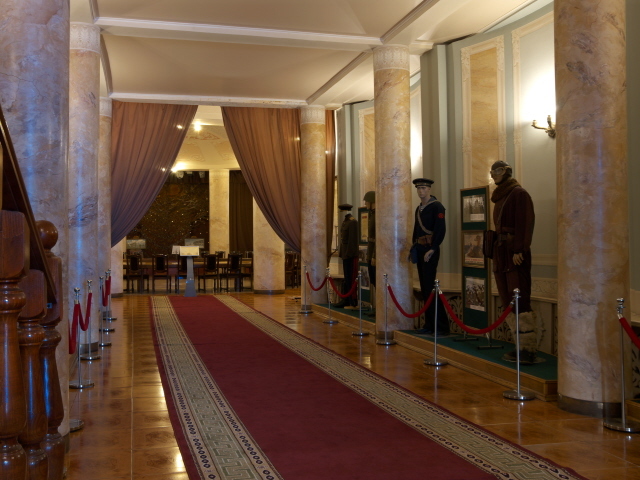 The front part of the wine tavern hall doubled up as a little Stalin museum, full with depictions of the man at various stages in his life and in various forms: photos, paintings, busts/statues and even prints on decorative plates. There were also some artefacts that may have been personal belongings, such as a typical jacket, a pipe he smoked, a telephone, records and a player, books, etc., and pitchers from the house in Gori, Georgia, where Stalin was born. The rest of this stretch of tunnel had a collection of framed Soviet-era propaganda posters on the wall and a single scale model of a tank on a plinth in the middle (don't ask me why.) And that was the end of the tour and we were bid farewell by the local guide and then escorted to the metro by our tour operator's guide. All in all: the tour may have some cheesy and dubious elements, but also offers some interesting insights and a degree of historic place authenticity that makes it worth it. (Although you never know how much of it is reconstruction and what's still authentic at such a place …). If the rather steep price, and the rather light-hearted approach doesn't put you off, I think I can (just about) recommend it. Location: in a rather hidden spot behind a stadium out in the Moscow suburb of Izmailovo, some 6.5 miles (10 km) to the north-east of the city centre (Red Square). Official address: Sovetskaya Ulitsa, 80, building 1, 105122 Moscow. Access and costs: restricted, by guided tour only; very expensive. For foreigners the price is a minimum of 5000 RUB for individuals or couples, from 3 to 9 participants the price is 2000 RUB per person. From 10 or more participants the price drops to 1600 RUB per person. Several Moscow tour operators offer excursions to the Stalin Bunker – and prices vary a fair bit, so shop around to see what the surcharges are. I've seen some offers that were well over twice the museum's own asking price. Fortunately I found an operator (simply called "Tours of Moscow") who normally deals with ex-pats and students who happened to be able to arrange a tour for roughly the original price levels. For that I contacted an acquaintance in Moscow to ask if he'd join us and he even brought together a small group of extra people, so we got it down to the mid-price level. Timings for the tour have to be arranged in advance individually. Best be flexible and/or start planning well ahead of time. Our group was met 20 minutes before the bunker tour at Partizanskaya metro station from where we were escorted to the bunker entrance. To get to the station use line 3 (dark blue), which goes right through the city centre … but it's a long ride, do not underestimate the distances in Moscow! Stops are also a very long distance apart from each other out in the suburbs, so the whole ride can take up to 40 minutes. If you have to make your own way to the bunker, then it's about a 15 minutes' walk for the mile or so (1.4 km). First turn left from the metro exit and left again past the supermarket, then turn right into Vernisazhnaya Ulitsa until you get to the approach road to the stadium. There's a barrier, where you either have to be met by your guide(s) or explain to the guard that you want be let through to go to the bunker (try saying something like “boonkerr Stalina – ex-koors-ee-on”). Time required: The tour at the bunker itself lasts about one hour, but you have to factor in the walk to the entrance and the ca. 20-40 minutes' metro ride from/to the city centre, so in total you're looking more like up to two-and-a-half to three hours. Combinations with other dark destinations: nothing else out here – see under Moscow. Outside Moscow, in fact quite a distance away, is another Stalin bunker, namely in the city of Samara on the Volga in southern Russia. Combinations with non-dark destinations: You will see it from the walk to the bunker entrance: Izmailovo is also home to an unlikely Disneyland-like complex of faux-historical buildings called collectively “Izmailovo Kremlin” (allegedly as 'cultural centre'). Despite the OTT kitsch overload this may be of interest to some, especially a) shoppers, in particular at the Izmailovsky flea market, which is said to be the best place for souvenir hunters (e.g. Matrioshka dolls in their tens of thousands) and also genuine antique Soviet relics such as medals, badges, hats, military uniforms etc. ; and b) those into crazy quirky museums, of which the Izmailovo Kremlin has several: there's a Museum of the History of Vodka, an Animation Museum, a Museum of Russian Tales, a Bread Museum and a place called World History in Plasticine. How long-lived any or all of these may be, however, I cannot say. Behind this kitschy complex, on an island in the lake (linked by bridge) is a more genuine complex of old architecture, the Izmailovsky Royal Estate set up by Peter the Great's father and includes a 17th century multi-domed cathedral. South of this is the vast woodland recreation range of Izmailovsky Park. But for anything more like classic tourist sightseeing you'd have to head back to the centre of Moscow.